It’s been a while since I last updated my blog. The last you’d heard from me, I was trying to lose weight. Well, I did! I lost 4 1/2 stone over a 14 month period, and have now maintained the weight loss for coming up to 1 year. I went from a BMI of 36 (obese) to 24 (upper end of healthy). 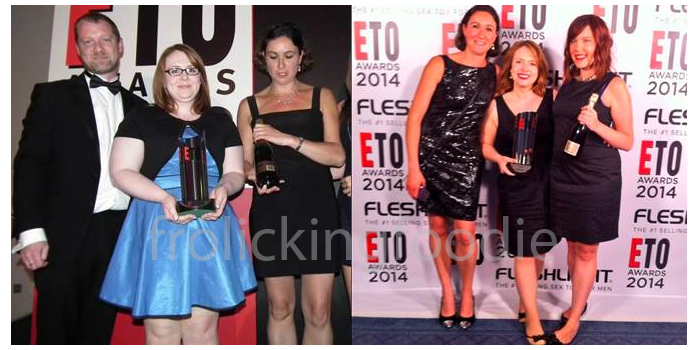 It’s quite a big change and though I’m not skinny (and don’t think I ever will be!) my body is much healthier, fitter and stronger. I’m contented with where I am now. What’s made you decide to lose weight? The key thing to getting started is to be in the right frame of mind and by seeking out some hints and tips, you’re priming yourself to be in the best possible place to start. For me, the catalyst was seeing a photo of myself in a trade publication. I was wearing a lovely blue dress but all I could see were multiple chins, an expanse of arm chub and pudgy knees. I’m ashamed to admit that I actually cried when I saw the picture. More than that, I knew I was the heaviest I’d ever been and I was genuinely worried about giving myself unnecessary health problems. But I turned that upset and worry into determination (the right frame of mind) and looked for blogs like this for inspiration. Some of what I have to say may not be what you want to hear, but this is a true account of what has worked for me. People talk about 1lb a week being a healthy rate of weight loss. Let’s break it down… it’s noted (and disputed – the human body does nothing strictly by formula) that 1lb of fat roughly equates to 3500 calories. That 3500 calories would be a deficit of around 500 calories a day. A deficit can only be achieved by burning more calories through exercise or not consuming the calories in the first place – and 500 calories are easy to eat and difficult to burn. So even making a 500 calorie a day deficit, it’ll take you over 3 months to lose 1 stone! No wonder people give up quickly when they don’t see results. 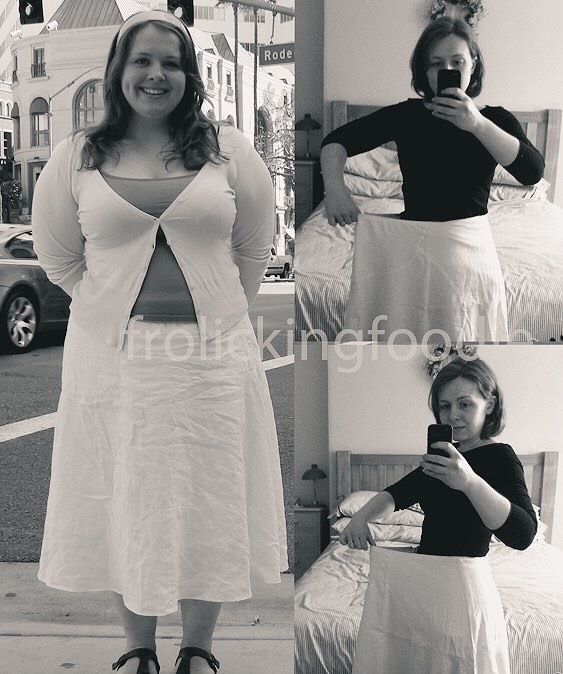 I found losing weight to be long and slow and boring – very, very, very boring. I don’t want to put you off, but this is the truth. It’s a bit of a watershed moment when you realise you are going to have to be in this for the long haul (especially if you have quite a bit to lose) and you have no choice but to commit to a long-term change in lifestyle. That means making healthy decisions, consistently, over an extended period of time. Like I said – long, slow, boring. But so, so, worthwhile and the results will creep up on you. Remember that photo of the blue dress I mentioned? That’s it below left, and below right I’m at the same event exactly 1 year later. Not a magical year, or an extreme diet – just a year of making healthy decisions day in, day out. You know the saying about fail to prepare and prepare to fail… ugh, it’s right. I bet you’re a planner? Great! Now follow through, as planning and preparation can only get you so far. I cannot emphasise enough how important it is to plan your meals and then stick to the plan. Making healthy food choices, consistently is key to your success – and being prepared makes succeeding easier. The thing I found helpful was to think about how calorie dense food was. If I wanted to eat larger portions to feel fuller, I needed to choose a lower calorie density food (I am still known to eat a whole cucumbers like you would a banana!). If I wanted to eat a higher calorie density food, I needed to eat less of it. More often than not, I tried to have a little bit of high calorie density food, padded out with a lot of lower calorie density food. In essence, this seems to be how the Slimming World model works and I found their recipes – in their magazines, books and online – to be satisfying and inspiring. Plan in advance – I always planned out my week’s food, working in at least 2 new recipes that I knew I would be excited to cook. In fact, I still do this! Getting into a dull routine will only lead to boredom/temptation and losing weight is boring/tempting enough as it is. Plan to avoid temptation – Are you really going to be satisfied with a salad on a Friday night? If you are, you are a better person than I am. I would plan for a healthy curry or one of my excited-to-try new means, so I didn’t feel deprived and with an excuse to reach for the takeaway menu. Plan for difficult situations – For me, a lunch on the move and parties were my difficult situations. So if I knew I’d be on-the-go over lunchtime, I’d take supplies with me (carrots, chicken breast, banana etc) so I wouldn’t be famished and resort to something unhealthy. Alcohol is the wrecker of many a healthy eating plan, so if I was going to a party, I’d take soda water if I suspected the host wouldn’t have it and water down every single drink I had. Will power is finite. Sometimes you will simply have none left. Besides, if you are building a healthy new lifestyle that you intend to maintain for the rest of your life then total abstinence is not going to be a part of it. Correct? I tried to think of each meal as part of my day, and each day as part of my week. So while my whole week didn’t depend on having or not having one treat, I was careful to think about how it factored in to everything else I was eating and doing. Did I really want that treat more than getting to my end goal faster? Sometimes, the answer was yes. And when it truly, genuinely was a yes – I would have my treat and enjoy it. A smile on my face, with only 500 metres to go! You have to make being active a regular part of your life and keep doing it (and here’s that word again) consistently. Being motivated and doing something challenging – but manageable – is key. You don’t have to go to the gym, or even take up running to be more active and feel (and see) the benefits. My aim was simply to be active more days of the week than I wasn’t. I made promises to myself that I had to keep (“I’ll walk into town on Saturday”). Then I started to make more challenging promises (“I’ll walk into town and back on Saturday”). Making promises, being stubborn, being motivated – it’s all the same thing and it actually makes exercise easier. Bear in mind it will take you a while to build up a level of fitness, so make sure your initial goals are manageable for you. It took me a full year to build up to being able to run 5k, which I did in 40 minutes. I can honestly say that getting to that point was incredibly difficult, but there were many mini goals along the way to keep me going. And I’ve kept going, making myself new and more challenging promises. 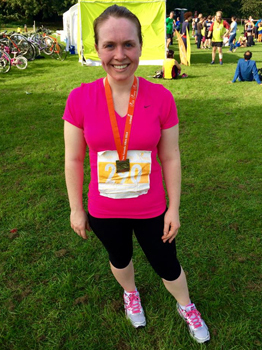 In 2014 my resolution was to run my first 10k – which I did in 56 minutes! 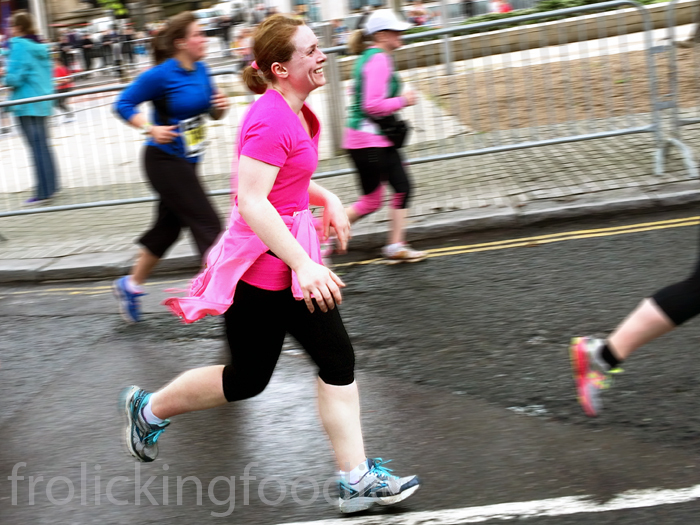 I was astonished – twice the distance in just another 16 minutes?! Sometimes I’m not motivated and the finish line feels far away, but I tell myself those are the days that count the most and sometimes just doing it because you said you would it is all that matters. No one can give you fitness. That is what makes me even prouder to have achieved it, even if it has taken a long time. This is a bit of a controversial topic. I found that apps to help you log your food, log your exercise and log your weight really helped me to be accountable. It helped me focus on the impact of what I was eating and doing. I really needed to re-educate myself on this front and the apps gave me objective figures and feedback. I weighed myself and measured my waist, hips and arms. I even logged it in a spreadsheet. BUT I didn’t worry too much about fluctuations from week-to-week and this is why I don’t necessarily get on with slimming clubs. The focus of a club is always week-to-week, as though what you did in the past week is directly reflected on the scales. I found a slimming club could be just as demoralising as motivating because of this. It turns out that for me, being accountable to myself was good enough. I still keep up the spreadsheet and weigh myself weekly (not obsessively – I sometimes forget so it’s often a day or two out!). However, this has stood me in good stead to keep the weight off for a year as I get an early indicator if I’m slipping. I see it as no more than an objective measure that usually confirms things when I know I’ve been overindulgent… I no longer log my food (now THAT is really boring), but I do continue to log my exercise to keep an eye on my progress and to formulate new challenges. I’m keeping the white skirt, but not because I want to be able to wear it again. When you start, you will likely have been accustomed to certain eating or activity habits. At the beginning, making healthy food and activity choices is about 80% will power and 20% habit. It’s really, really difficult. As you progress, this balance will shift and soon your tastebuds and habits will change. 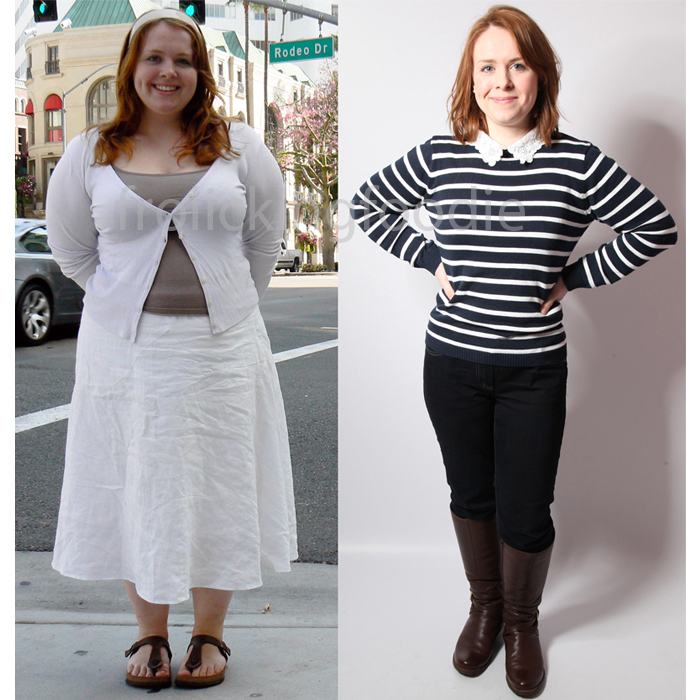 The conscious and consistent decisions you take to help you lose weight will then become second nature. And before you know it, 2 1/2 years have passed and you have an entirely new lifestyle and are stood in good stead to keep the weight off. So, dig your heels in and prepare for some difficult times ahead but stay motivated wherever possible. Believe me that it gets easier, but you simply cannot get to the end without the boring bit in between. Good luck! Are you coming back to blogging, or not yet?